This picture was taken in South Wales about 1922 - 25 by the late Joe Shervington, a friend of the father of Tony Robinson. It was taken on the occasion of a visit to Max Dunn who was then at Tredegar shed. It is assumed that it was taken at Tredegar but there is no script on the back of the pic, which shows the front of a shed on the left with a number of "Coal Tanks" in evidence plus in the middle distance some vintage carraige stock which may be old Merthyr Railway stock. The question, as so often, is: can anyone confirm where it is? No doubt about it - Tredegar in the Sirhowy valley. The track diagram in the directory of British Engine Sheds 1 confirms this. The photograph was taken from the buffer stops of the coaling stage looking north towards the station. The LNWR shed to the left was built in 1886 and closed in 1960. A �Coal Tank� is resting there. Some notable people from Tredegar are Thomas Ellis, who worked on the first steam engine with Trevithick, Aneurin Bevan, creator of the national health service, Neil Kinnock of new labour. It was the site of the first ever deep coal pit in South Wales. There was also the 1808 tramroad link to Newport which inspired the Stockton to Darlington railway. Photographs and a plan in W.W. Tasker's The Merthyr, Tredegar & Abergavenny Railway (OPC, 1986). Pages 52, 63, 64, 78, 79 confirm that this is Tredegar Shed, looking north from the top of the water tank. Most definitely Tredegar. It is before the remodelling of 1930 when the shed trackwork was changed to allow for a longer platform. Also JM Dunn had been transferred to Bleanafon before the remodelling took place. There are plum and cream carriages in the siding which suggests a time towards the beginning of the 1920s, the 6-wheelers in the foreground are interesting. These could possibly be the miners carriages, though they were usually stored at Nantybwch. The carriages used on the Sirhowy were 28' 4-wheelers (I refer everyone to Philip Millard's LNWR Soc. published book on the subject). The 4-wheelers were coupled in sets of 5. Also if you look at old photos (pre-grouping) of the Sirhowy miner's trains they are monochromatic in their colour and hence my guess as to what we are looking at in this photo. I agree with Harry Jack in that the photo was taken from the top of the coal hole, it is too high to have been taken from the end of the coal wagon siding. Finally if you look carefully the wagons in the background have Tredegar written on them (you get to know the distinctive wagon sides when you've modelled so many!). A very interesting photo. Are there more where that came from? Just an extra bit of information. Out of shot and to the extreme left of the engine shed are the company offices of the Tredegar Iron and Coal Company, the original owners of the Sirhowy Valley Tramway. 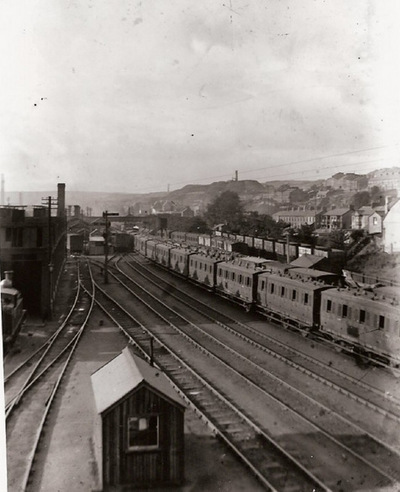 The wagons on the right are in the Gas Works Sidings. May I suggest that all the carriages, but particulary the ones on the middle line, are North London Railway imported to Tredegar for use on the famously long miner's train down the valley. Finally, to my great delight I have some of the engine shed blue bricks (all marked L&NWR) topping my garden wall. This is definitely Tredegar. In the background, slightly to the right, can be seen the stack from Graham's no. 9 pit. The location of the sidings and trains is in Park Place. Sadly all gone now replaced with a single lane by-pass and a roundabout where the level crossing gates once stood.